Embracing the seasons has for me, come to be the most exciting part of life in Dorset. Early spring is magical, everything has turned a tinge of green, trees are covered in buds or blossom and spring flowers are popping up everywhere. 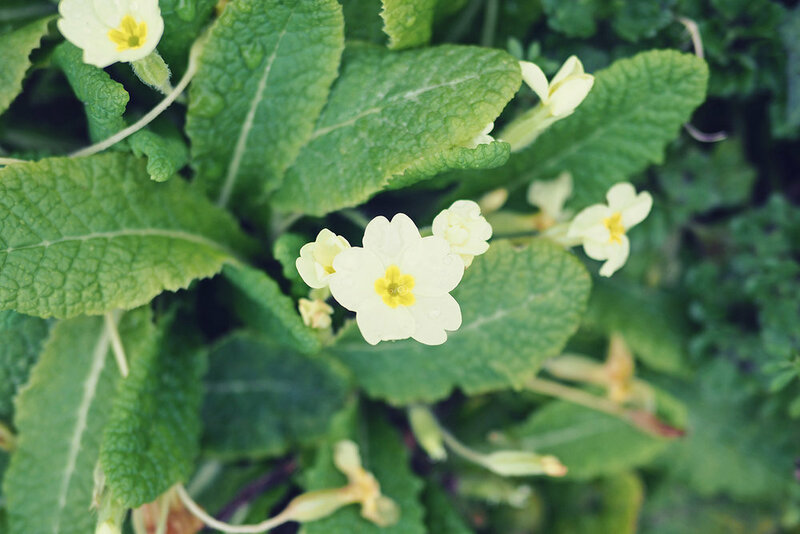 Our garden is currently blanketed in the prettiest primroses and these just happen to make for the most perfect edible flowers for cakes. Crystallised Primroses are one of the easiest things to make and can add a little pop of colour and sparkle to cakes. Perhaps I have just been trapped in city life for too long. Since moving to the countryside I've become fascinated by foraging in the woods, fields and hedgerows that surround our new home. It blows me away how many plants are not only edible but are actually flavour enhancing and packed with health benefits. The satisfaction from being able to pick something fresh (and free!) from the garden and create something delicious is rewarding for the soul and the palate. We're currently enjoying wild garlic and young nettles as spring tries to shake off winter. I've always been interested in edible flowers and begged Nico to let me take a small piece of very valuable real estate in our indoor garden to start growing my own. My baby marigolds and calendulas are starting to bloom, but it's the primroses in the wild outdoor garden (that have been covered in snow more than once!) that are abundant right now. All kinds of Primroses are edible and they come in a multitude of colours (we’re lucky to have yellow and purple growing fairly wild here!) If you are picking them or buying them, always make sure they haven’t been sprayed with nasty chemicals. Once picked, give them a rinse to remove any soil or insects and pat dry with kitchen roll. Lightly paint the petals with the egg wash, be sure to cover both sides of the petals. Holding by the stem, dip them in the sugar. From a height, sprinkle sugar on the underside of the petals too to make sure they are completely covered. Voila the next day these pretty blooms are ready to adorn your desserts, cakes, cupcakes or whatever you like! Stored in a cool, dry place in a tight container, you can keep crystallised primroses for up to a year! I’ve used mine to decorate my Easter carrot cake cupcakes with marshmallow meringue icing, they add a subtle pop of pastel sparkle to this sweet treat! If you have any ideas or recommendations for how to use edible flowers for cakes - drop us an email - I'd love to try it out!